Lilikoi butter or curd can be used in so many different ways including as a topping, filling, marinade or dressing. An elegant addition to any dish and simple to make. 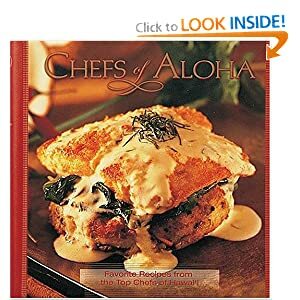 Order Chefs of Aloha - Recipes from Hawaii's Top Chefs - Volcanic Ahi, Lollipop Shrimp, Toy Box Tomato Salad, Golden Temple Bananas - the recipes in this book are as intriguing as the top Island Chefs who created them. Mix the eggs and sugar on low heat. Slowly add the lilikoi juice. Then the butter. Cook for approx 15 min. until desired thickness. You can leave the seed in o strain them, its up to you. To make lilikoi juice using fresh fruit, spoon the seeds of 6 lilikoi into a blender, add 1/4 water and turn blender on the lowest possible speed for a minute or so....just enough to loosen the pulp from the seed. You don't want to blend on high or for too long and the seeds will get pulverized into the juice.